Why does Monkey fear Leopard? Why does the Reed Warbler babble? How did Jabulani outwit the Lion? 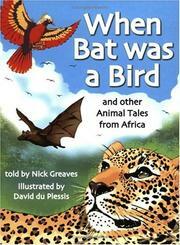 These and other intriguing questions are answered in When Bat was a Bird. Twenty-four fresh and exciting stories feature memorable creatures both real and magical. In his latest collection, author Nick Greaves draws once more from the lore, mythology and history of various southern African tribes to relate a new collection of tales that is bound to become a firm favourite along with the highly successful When Hippo was Hairy, When Lion Could Fly, and When Elephant was King.